St. Joseph quarterback David Summers during the New Canaan at St. Joseph football game, Sept. 8, 2018. St. Joseph’s David Summers wanted to get the whole recruiting business done before his senior season. 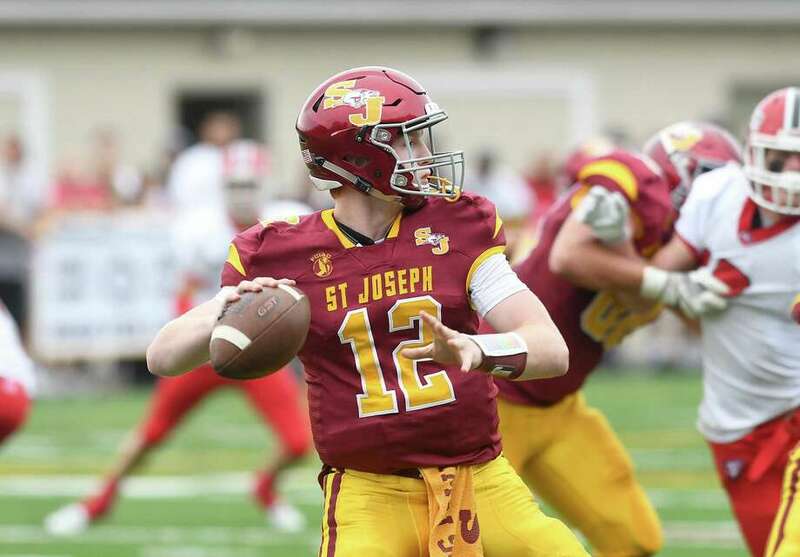 He thought he’d found the perfect fit in Maryland, so the quarterback verbally committed there in late May, thankful that he could focus on winning another state title with St. Joseph and not on recruiting in the fall. But when Maryland’s football program descended into turmoil in the aftermath of offensive lineman Jordan McNair’s death from heatstroke, which ultimately led to head coach D.J. Durkin’s removal before the season, Summers’ best-laid plans began to unravel. Maryland hired Mike Locksley from Alabama to take over the program on Dec. 4. Interim coach Matt Canada, who’d recruited Summers and was one of the primary reasons for Summers’ commitment, left the program. Suddenly, Summers wasn’t feeling it from Maryland anymore. As much as he tried to avoid it, it was recruiting season all over again for the 6-foot-3, 205-pound senior. Instead of sitting idle, Summers took initiative. He began sending his films out to several programs. UCLA reached out. Massachusetts offered him a scholarship. In early January, Summers learned that Syracuse had just lost a quarterback to transfer, leaving the Orange with just three on their 2019 roster before signing day. The Orange were looking for a QB and Summers was looking for a home. It was the perfect fit, he thought. Over the next two weeks, Syracuse defensive coordinator Brian Ward and head coach Dino Babers made trips to St. Joseph. They visited Summers at his home in Fairfield and offered him a scholarship. Summers took his official visit to upstate New York last weekend and gave his verbal commitment to the staff before heading home Sunday. Summers collected just about every honor imaginable during his varsity career. A three-star recruit, he completed 61 percent of his passes for for 5,858 yards, 88 touchdowns against 15 interceptions in his two years at St. Joseph and earned first-team All-State honors both times while leading the Hogs to back-to-back state championships. This month, Summers was named 2018 Connecticut Player of the Year by the Connecticut High School Coaches Association. Syracuse, meanwhile, is coming off its best season under Babers and its best season since 2001. The Orange, behind senior Eric Dungey, went 10-3 and beat West Virginia in the Camping World Bowl. Summers said he loved the coaching staff, especially their honesty. When he first attended Syracuse’s junior day a year ago, Summers said Babers’ staff told him up front they weren’t looking for a Class of 2019 quarterback, which stuck with him. He’ll head to Syracuse this fall as one of four scholarship quarterbacks on the Orange roster, behind projected starter and redshirt sophomore Tommy DeVito — with whom Summers shares a personal trainer, Leon Clarke — and senior backup Clayton Welch. A third quarterback, Rex Culpepper, finished the season practicing at tight end. Regardless of how it shakes out, Summers is excited to make it official on National Signing Day Feb. 6. Syracuse will play at Maryland in its second game of 2019, Sept. 7. But with his connections there all but severed, “it doesn’t really mean too much to me,” he said.